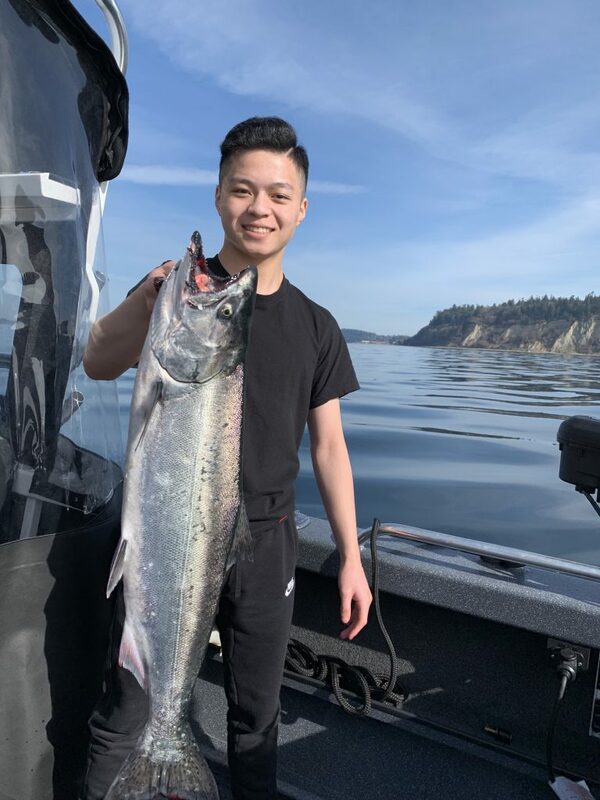 This 20 pound hatchery king was caught last week at Possession Bar and there have been numerous other “springers” showing up in catches around open marine areas of Puget Sound, Strait of Juan de Fuca and San Juan Islands. Photo courtesy of Justin Wong, owner of Cut Plug Charter in Seattle. We all know what day it is today – April Fools’ – but the news on the fishing front isn’t a joke and the only thing fooling anyone might be a case of spring fever keeping anglers from doing anything else but wetting a line. 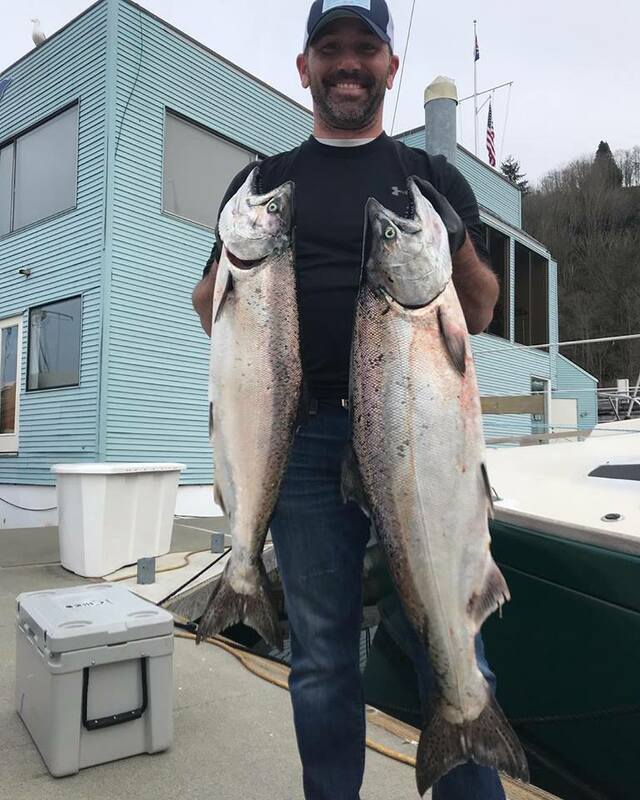 In the past two weeks, anglers from the eastern Strait of Juan de Fuca into the San Juan Island and northern Puget Sound are reporting some early arriving migratory kings better known as “springers” in the 13- to 20-pound range. “There’s been some nice fish at the bar (Possession Bar) if you pick through the smaller fish,” said Justin Wong, owner of Cut Plug Charter in Seattle. Most are likely heading to the Skykomish River and other rivers in southern Puget Sound while others are making their way toward southern British Columbia. Catches of these nice-size fish are also mixed in with a good amount of their smaller brothers and sisters aka winter chinook averaging 5 to 10 pounds and there’s still plenty of time this month to get out and catch them. The eastern Strait (Area 6), San Juan Islands (7) and northern Puget Sound (9) are open daily through April 15; and the western Strait (5), east side of Whidbey Island (8-1 and 8-2) and southcentral Puget Sound (11) and Hood Canal (12) are open daily for winter chinook through April 30. Southern Puget Sound (13) is open year-round. In northern Puget Sound fishing has been decent the past few days at Midchannel Bank off Port Townsend; Double Bluff off Whidbey Island; Pilot Point; Point No Point; and both sides of Possession Bar. This is also the time of the year when places like south-central Puget Sound in the Tacoma-Gig Harbor area come back to life. The unusually warm weather and calm waters have allowed for other fishing activities to start blooming like the daffodils in the Skagit Valley and cherry blossom trees at the UW! That includes hitting up your favorite year-round lakes for freshly planted trout, planning a trip to the coastal beaches that are loaded with a bounty of razor clams or booking a charter trip to hook into solid catches of lingcod and rockfish off the coast. 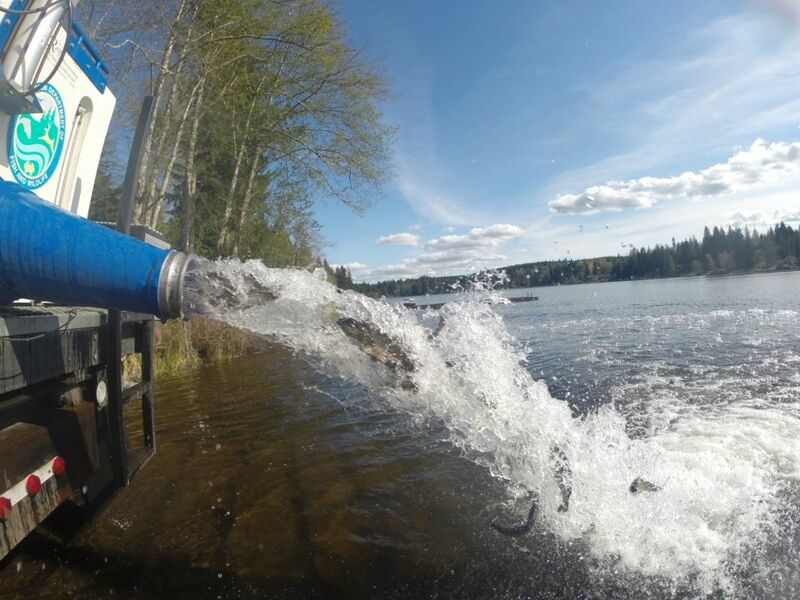 I’m out of breath with that list of trout plants but it doesn’t include the many eastern Washington lakes and ponds that are finally receiving their trout plants since the snow and ice have started melt away. The statewide lowland lakes’ trout opener is April 27-28. For weekly stocking updates, go to https://wdfw.wa.gov/fishing/plants/weekly/. 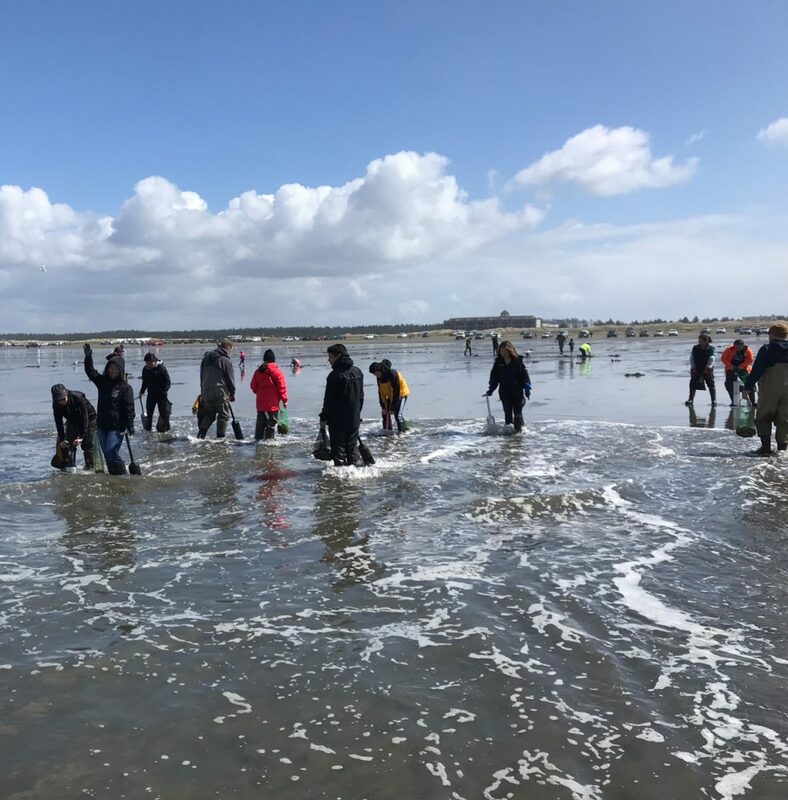 Time is running out on your chance to hit the coastal beaches for what has been another successful winter and spring season of razor clam digging. In fact, turnout was much more than expected at Copalis during the last series that WDFW has decided to keep it closed on the upcoming digs. Upcoming digs are April 6-7 at Twin Harbors; and April 6-8 at Mocrocks. Digging will be open during AM low tides until 12 p.m.
Here’s how diggers fared during most recent digs – Twin Harbors, 9,136 diggers March 22-24 dug 119,494 clams for 13.1 per person average (first 15 clams dug pp is a daily limit); Copalis, 7,039 March 23 had 92,693 for 13.2; and Mocrocks, 11,632 March 21-22 and March 24 had 169,252 for 14.6. Season coast-wide totals for 49 days of digging from Oct. 11 to March 24 is 178,675 diggers with 2,260,743 razor clams for 12.6 per person average. A breakdown by beach showed Twin Harbors (49 days) had 74,787 diggers with 875,272 razor clams for 11.7; Copalis (19 days) had 50,979 with 676,014 for 13.3; Mocrocks (24 days) had 51,132 with 705,459 for 13.8. More tentative digs are planned April 20 at Long Beach, Twin Harbors and Copalis; April 21 at Long Beach, Twin Harbors and Mocrocks; and April 22 at Twin Harbors and Mocrocks. Approval will be made by WDFW about one week before the final digs of the season.